ILISA specialises in providing the best possible environment for Spanish training for either professionals or students interested to improve their Spanish effectively but also enjoyably. Right now it is the best time to register for our Autumn semester programs. We offer Executive training for professionals who need to improve their Spanish skills due to their job requirements or a semester long programs for those who are interested in receiving university credits for taking Spanish classes abroad. All of the programs can include private lessons and a homestay with a local host family, which can have a huge influence on improving your understanding and speaking ability skills. For more information, please feel free to contact our schools, either via our website http://ilisa.com/ or via email to spanish@ilisa.com. During the months of May, June and July we were proud and happy to host 13 groups from different Universities and Colleges that decided to come to ILISA for their Study Abroad Programs. Most of the programs combined Spanish training with weekly cultural activities, weekend excursions to either beach resorts or rainforests and a homestay accommodation with local costarican host families providing a unique authentic experience to the students. Some of the programs also included service learning projects, volunteering and visits to local leading industrial companies, meeting their leaders and having a chance to have an enclosed look into their logistics and their systems. Right now it is the best time to think and plan the next year's programs and we welcome you to contact us in case you would be interested in either participating in this great life experience or would like to provide this opportunity to your students. Please contact spanish@ilisa.com for more details. Costa Rica: achieves the top score in "Happiness"
We are proud to announce that according to the Costaricanews, Costa Rica achieved Happy Planet Index top score! What does it mean? It means that Happy Planet Index, which is the leading global measure of sustainable well-being, looked at 151 countries across the globe and analised and scored them on a variety of metrics to measure life lenght, happiness and how sustainable lives are for the people that live in them. All in all, it boils down to each country's efficiency at producing long and happy lives per unit of environmental output. Costa Rica was ranked #13 for Experienced Well-being, #28 for Life Expextancy and #77 for Ecological Footprint. Overall it scored 64.0 points and won over other 150 countries , followed by Vietnam on the second place and Colombia on the third. For those who are not familiar witht the system, HPI was developed in response to global over-emphasis on indicators that only tell bits and pieces of what is really happening inside nations. "By using indicators like GDP to measure success we are not accounting for what really matters, producing happy lives people now and in the future," says the organization. Ceviche was once a dish found only by brave travellers in Peru who were willing to try something new. This delicious recipe has grown in popularity recently and ceviches are now found at almost every local restaurant all over Costa Rica. Directions: Clean and cut Marlin into small cube size pieces and put into a mixing bowl. Chop onion and peppers - semi-fine and add fish in the bowl. Pour lime juice on top of the fish just to cover the top. Add a small amount of sugar to taste (to balance the citrus acidity). Mix and let sit in the refrigerator for at least 2 hours (the more the better) before serving. Chop avocado and put it on top, serve with tortilla chips. 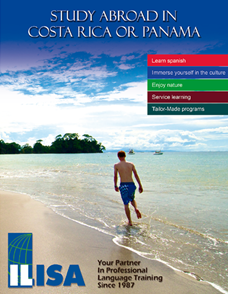 Costa Rica: achieves the top score in "Happines"
Here you can download our full color 12 pages brochure that gives you a clear idea about our services and courses. The month of July was full of Graduations. We said our "Goodbyes" to a lot of students and were impressed by how much progress each of them has made. We will be more than happy to see all of you in the future. With the group of Texas Wesleyan University we had a lot of fun trying to make empanadas during our cooking class. Our kitchen ladies were excited to show us how to create the perfect shapes and taste the real Costa Rica! It is always nice to get some exercise after the school, that's why we go and play football on Wednesdays. Everybody from the school is welcome to join and practice some football skills between each others. Copyright © *|2015|* *|ILISA|*, All rights reserved.